360,000-cp NightRay Vehicle-Mounted Spotlight with new H3 Halogen bulb is an affordable spotlight for professional utility repair and inspection crews and power lineman. Aug. 31, 2012 - PRLog -- KH Industries announced today that it has lowered the price on its new NightRay H3 Spotlights, making the NightRay H3 Spotlight the most affordable NightRay Spotlight. Available as wireless, hardwired, or dual controlled, the new 360,000-cp spotlight-only is an affordable professional grade spotlight for utility repair and inspection crews. “The Par 46 H3 Halogen spotlight bulbs are exceptionally bright. We’ve been testing these bulbs for the last year and are confident that our customer’s will be impressed with the light output.” explains John Herc, vice president of KH Industries. The H3 Halogen spotlight bulb provides hundreds of hours of run time and cost 50% less than dual filament bulbs. The NightRay H3 Spotlight, has all the durability of the traditional dual-filament NightRay spot/flood lights, but with a much brighter bulb. “Over the years, customers have requested a brighter spotlight. Last year, we came out with our HID NightRay, which is the brightest vehicle-mounted spotlight in the utility industry. But not all customers require the intensity of HID or could afford the price.” explains Herc. 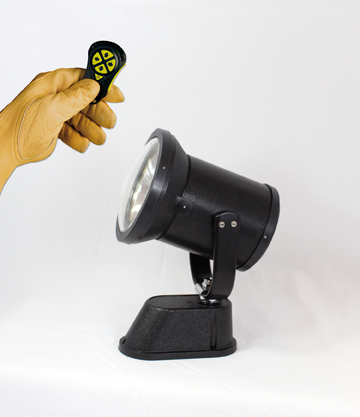 “The Par 46 H3 Halogen spot-only is an affordable solution for nighttime inspection and repair professionals that are looking for a bright spotlight that is designed for the rigors of the utility industry.” All NightRay Spotlights are designed for use in extreme weather conditions, including snow, ice and saltwater. NightRay vehicle mounted spotlights were designed specifically for the rigors of the utility industry and over the years have become the worklight of choice for utility power lineman. Because of NightRay's rugged design, the spotlights are also used by the U.S. Military and Department of Defense, Fire and Rescue agencies, oil and gas industries, towing, and marine and fishing operators.